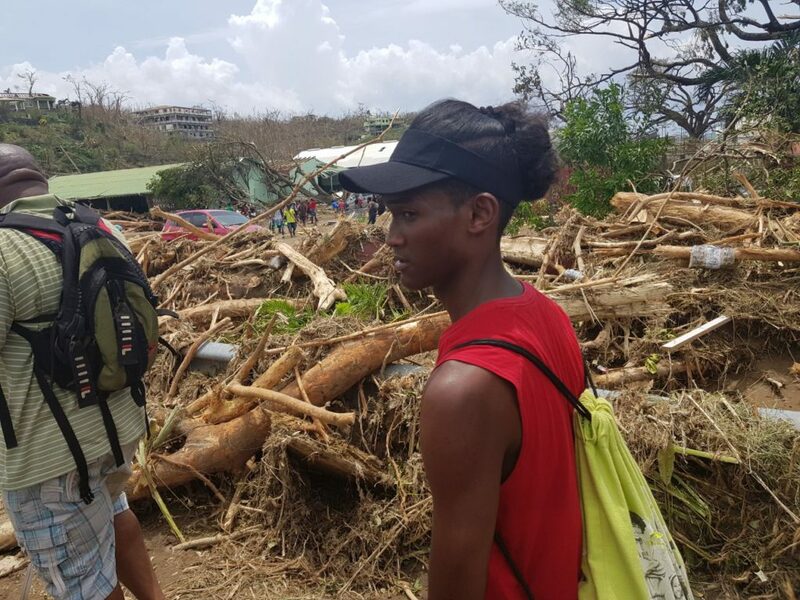 Maria, a category 5 Hurricane made a direct hit on Dominica now Dominica to receive 24 Million Dollars plus in Hurricane-relief funds from the EU to continue rebuilding. ROSEAU, Dominica (CMC) — Dominica to receive EC$24.7 million (One EC dollar=US$0.37 cents) from the European Union representing the first tranche of an EC$34 million package towards the reconstruction of the country following the devastation caused by Hurricane Maria last year. “This contribution from the European Union will assist us with the ongoing rehabilitation of communities throughout Dominica as we seek to reconstruct in a climate resilient way,” Prime Minister Roosevelt Skerrit said. The EU said that the grant would support the construction of two emergency shelters in the Castle Bruce and Jimmit areas and the rehabilitation of 1000 houses in various affected communities. It said the reconstruction would be carried out exclusively according to the Building Back Better approach and the highest resilience standards. “Dominica has been under hard trial during the last few years, but it is encouraging to see the mobilization and the commitment of all Dominicans to rebuild the country as a genuinely resilient nation. “As a European citizen I am proud that we stand together with the Dominican people and other members of the international community in this important endeavor,” said Daniela Tramacere., the EU Ambassador to Barbados, the Eastern Caribbean States, OECS and CARIFORUM. The grant will also support the Dominica Government in its revision of sector policies to include climate change adaptation practices and to reduce disaster risks while facing extreme weather events, in line with the island’s new National Resilient Development Strategy. The report continues to show that its the second post-disaster reconstruction grant Dominica will receive from the EU in three years, in addition to ECHO Humanitarian aid, following the EC$28 million provided for the rehabilitation of the water and energy infrastructure after Tropical Storm Erika in 2015. The latest funding comes in addition to the bilateral cooperation between the European Union and Dominica, which supports two critical sectors of the island’s economy, namely agriculture, and renewable energy. Under renewable energy, the country has been allocated EC$8.3 million, while the agriculture sector has been benefiting from the EC$48 million Banana Accompanying Measures programme. Dominica (not to be confused with the Dominican Republic on the island of Hispaniola) has received numerous strikes by tropical storms over the years, but only five direct hits from hurricanes since records began in 1851. Note, this is, in part, because Dominica is a small island, but also because it is uncommon for water temperatures to be warm enough to the east of the island to allow intensification of westward-moving tropical storms into hurricanes before reaching Dominica. The only major hurricane to hit Dominica was Category 4 Hurricane David of 1979. David killed 40 people and did $160 million in damage (2017 dollars). The most expensive storm to hit Dominica was Tropical Storm Erika of August 2015. Erika caused extensive flooding and landslides across the island, killing 30 and generating $500 million in damage (2017 dollars). The document shows that this was a disastrous 90% of their yearly GDP. Erika’s name was retired from the list of Atlantic storms due to its impact on Dominica, making it one of only two Atlantic tropical storms, along with Tropical Storm Allison of 2001, to have their names retired. Besides David, four other hurricanes have hit the island: Category 1 Marilyn of 1995, and Category 1 hurricanes in 1930, 1916, and 1915. Dominica to receive 24 million dollars from the European Union that will go towards the rebuilding of the infrastructure of the island. Dominica to receive 24 million dollars to continue repairing the grave damage to homes, roads, forests, and trails. Dominica to receive 24 million dollars from the EU in 2018 for the island’s recovery programme.